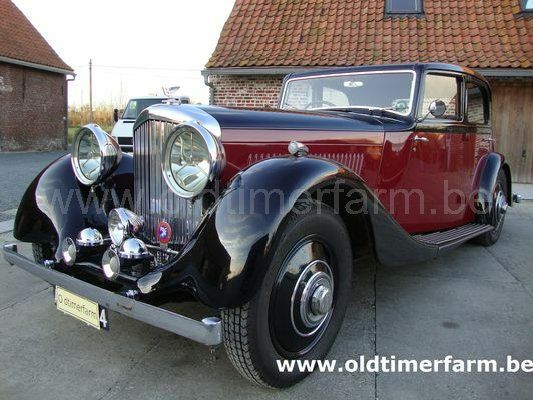 .Very rare 1935 Bentley 3.5 Litre Park Ward Sport Saloon with sliding sunshine roof. It is as original as it was when it was delivered to Sir P.M. Stewart on March 18, 1935: chassis #B68DG, engine #R2BL with highly sought after "Park Ward" Body # C. 793. Interior comes with leather seats, wood dashboard (with all factory original instruments) garnish moldings on doors. Rare original and correct Lucas headlights, sidelights, taillights and horns. Complete deluxe package including original Bentley "Flying B" mascot, optional luggage rack and spare tire cover. Also comes with the original under hood tools: jack, socket wrench and knockoff hammer, as well as the original owner's manual, hand starter and knockoff wrench. The engine runs as smooth as when it rolled off the Derby, England assembly line. The 4 speed manual gearbox and clutch are in very good condition. Aluminum body work, fenders and paint have not been recently restored but present well. Seats have been renewed rest of the interior is in good original condition, carpets showing wear. 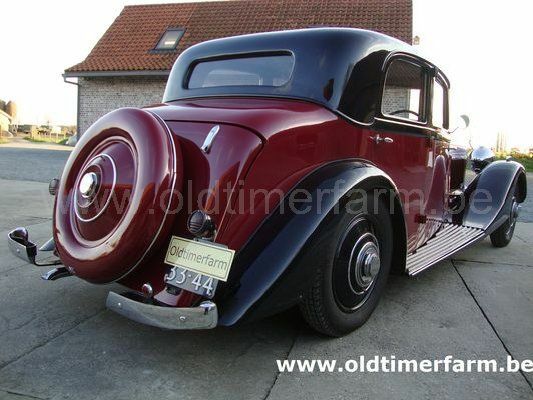 Car is as close to original as you will find for pre-WWII Bentleys. Very authentic.. Will be delivered with a stack of paperwork, including service history, shipping, owners, license records, even some of the original letters written between early owners and the Bentley Company, etc. Model History Total production of all Bentley 3 1/2 Litre cars was 1,191 units from 1933-1939. The 3 1/2 Litre has a 6 cylinder ohv engine with two carburretors, a four speed gearbox and servo assisted mechanical brakes. The 1935 3 1/2 Litre Bentley had quite remarkable performance for its year with a top speed of 95 mph with Park Ward Sport Saloon body. This particular vehicle being listed had a well-known first owner, P.M. Stewart of the London Brick Company, the largest brick manufacturer in the world (it's said 25% of the homes in Britain were constructed of London Brick). A couple of years after purchasing this car P.M. Stewart became Sir P.M. Stewart a first baronet. Specifications. Body : length/width/height/wheelbase – cm (in) : 442/175/?/320 (174/69/?/126); weight : 1118 kg (2465 lb). Engine. Front 6-speed 3669 cc (224 ci), manual 4-speed gearbox (3rd and 4th synchr. ), rear-wheel drive. Power : 105 bhp 3750 rpm. Top speed : 148 km/h (92 mph).